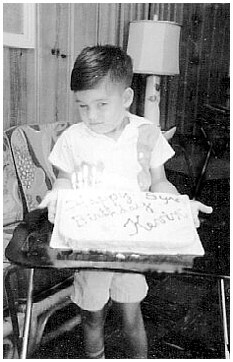 This one was taken at Che-ah's home in Jacinto City, Texas; and, if my OLDheimer's eyes are correct in seeing a "5" on the cake, it was taken on May 21, 1962. Notice how he is careful to tilt the cake upwards so you will be sure to see how pretty the cake was. Che-ah would have done without a cake (and Kevin may never have had one for his birthdays) if it had to be "boughten". She cooked it for him like she had always done for me. In appreciation, I helped him eat it. 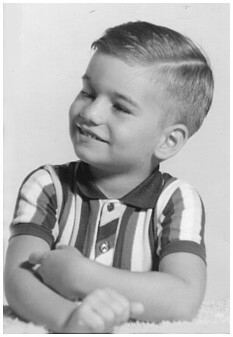 I think this one was taken a little later in 1962 - Kevin? 1962 was one of the years that Kevin and I were heavy on the miniature golf, the Pipe Organ Pizza, and driving, he on my lap, up and down our "secret road" which was a little used street along a railroad track. I think it was Westpark, but whether it was or not, it was not many years thereafter until it was a heavily traveled thoroughfare. I am obliged to tell you that Kevin selected and furnished the background music for this page.